Can Clean Energy be a Wedge Issue in 2012? Rolling Stone’s latest interview with President Obama was pretty dull, and in any case I nearly became ill just from reading the cloying, self-congratulatory introduction by (of course) Jann Wenner. I made it up to “Having complimented me during our last interview on my brightly colored socks….” and had to get up and take a break. Given all we’ve heard about and learned during the GOP primaries, what’s your take on the state of the Republican Party, and what do you think they stand for? First of all, I think it’s important to distinguish between Republican politicians and people around the country who consider themselves Republicans. I don’t think there’s been a huge change in the country. If you talk to a lot of Republicans, they’d like to see us balance the budget, but in a balanced way. ….But what’s happened, I think, in the Republican caucus in Congress, and what clearly happened with respect to Republican candidates, was a shift to an agenda that is far out of the mainstream — and, in fact, is contrary to a lot of Republican precepts. I said recently that Ronald Reagan couldn’t get through a Republican primary today, and I genuinely think that’s true. You have every candidate onstage during one of the primary debates rejecting a deficit-reduction plan that involved $10 in cuts for every $1 of revenue increases. You have a Republican front-runner who rejects the Dream Act, which would help young people who, through no fault of their own, are undocumented, but who have, for all intents and purposes, been raised as Americans. You’ve got a Republican Congress whose centerpiece, when it comes to economic development, is getting rid of the Environmental Protection Agency. ….I think it’s fair to say that this has become the way that the Republican political class and activists define themselves. Obama’s contention is that the GOP political class and activist base have worked themselves into a blind ideological fury, but most people who identify as Republican do not share their rigidity. They are more likely to lean in the direction of Independents and moderates. If this is true, it identifies a political vulnerability. Democrats ought to be able to exploit the differences between the masses and the ideologues, to set them at odds with one another. I’m not sure how many genuine “wedge issues” there are, actually, but one that shows up in the polls over and over again is clean energy. As I wrote back in January, clean energy is a wedge issue that favors Democrats. Read the whole thing to get the details of David’s argument. My guess is that this is unlikely to become a major campaign issue on its own, but you never know. If the right event comes along, it could push this into the spotlight and force Romney to take some unpopular hardline positions. 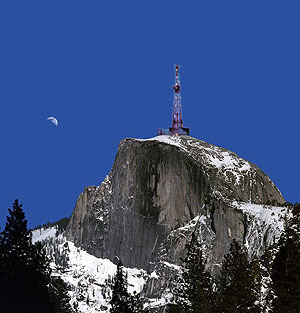 Ideally, I suppose we’d discover a huge shale deposit in Yosemite National Park and then demand that Romney disown all the folks on the right who would immediately pop up to insist that the Obama administration is anti-growth for opposing a drilling rig on top of Half Dome. That might do it.